Occupational asthma is a lung disorder in which substances found in the workplace cause the airways of the lungs to swell and narrow. This leads to attacks of wheezing, shortness of breath, chest tightness, and coughing. Asthma is caused by inflammation (swelling) in the airways of the lungs. When an asthma attack occurs, the lining of the air passages swells and the muscles surrounding the airways become tight. This reduces the amount of air that can pass through. In people who have sensitive airways, asthma symptoms can be triggered by breathing in substances called triggers. Many substances in the workplace can trigger asthma symptoms, leading to occupational asthma. The most common triggers are wood dust, grain dust, animal dander, fungi, or chemicals. 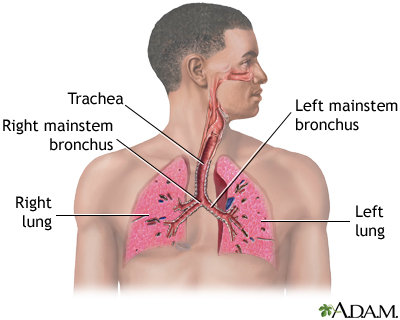 Symptoms are usually due to narrowing of the airways and tightening spasms of the muscles lining the airways. This reduces the amount of air that can pass through and it can lead to wheezing sounds. Symptoms usually occur shortly after you are exposed to the substance. They often improve or go away when you leave work. Some people may not have symptoms until 12 or more hours after being exposed to the trigger. Symptoms usually get worse toward the end of the work week and may go away on weekends or vacations. The health care provider will perform a physical exam and ask about your medical history. 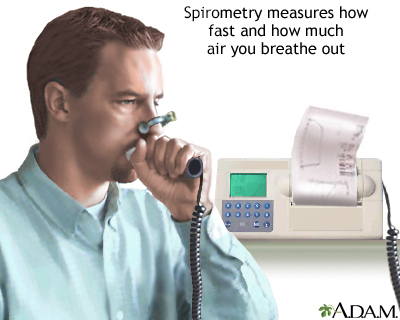 The provider will listen to your lungs with a stethoscope to check for wheezing. Moving to a different location at the work site where there is less exposure to the substance. This may help, but over time, even a very small amount of the substance can trigger an asthma attack. Asthma medicines may help manage your symptoms. Occupational asthma may keep getting worse if you continue to be exposed to the substance that is causing the problem, even if medicines improve your symptoms. You may need to change jobs. Sometimes, symptoms may continue, even when the substance is removed. In general, the outcome for people with asthma is good. However, symptoms may continue for years after you are no longer exposed in the workplace. Call your provider if you have symptoms of asthma. Talk to your provider about getting the flu and pneumonia vaccines. If you've been diagnosed with asthma, call your provider right away if you develop a cough, shortness of breath, fever, or other signs of a lung infection, especially if you think you have the flu. Since your lungs are already damaged, it's very important to have the infection treated right away. This will prevent breathing problems from becoming severe, as well as further damage to your lungs. Lemiere C, Vandenplas O. Asthma in the workplace. In: Broaddus VC, Mason RJ, Ernst JD, et al, eds. Murray and Nadel's Textbook of Respiratory Medicine. 6th ed. Philadelphia, PA: Elsevier Saunders; 2016:chap 72.